For this theme the goal was to create a more personal feel. So the design has strayed away from the usual “magazie-style” elements, and instead it is targeted to create a more classical blog-style design. Cion is great for anyone who wants to keep things simple while still maintaining a class appeal. Cion comes with 3 unique color schemes. If Purple isn’t your style, then why not try Cion’s Blue or Green skins? You can change your blog’s color scheme instantly and at any time from within the theme’s options menu. 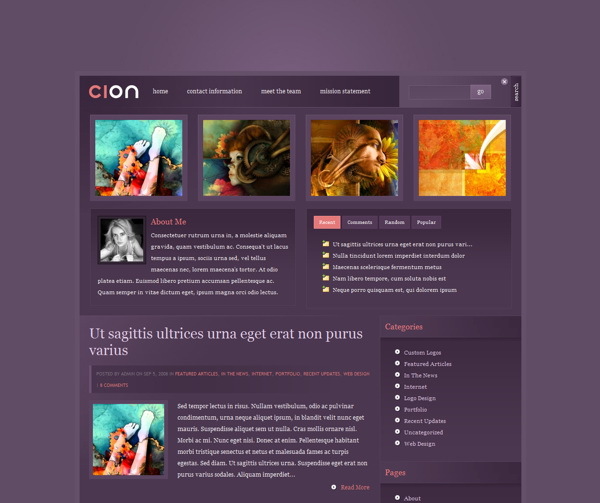 Cion is geared towards more personal-style blogs. For this reason I have added an “about me” section on the homepage which can be altered from within the theme’s options menu. You can also designate a photo to be used.This theme utilizes timthumb to automatically resize your thumbnail images. Because of this, only one thumbnail images is required per post, despite the various thumbnail sizes used in the theme. With Cion you can place 125×125 and 250×250 banner images in your sidebar, and 468×60 ads to your post pages with ease. Advertisements are handled from within wp-admin, and can be turned on and off at any time individually.